Here at UKACP we make it easy for you to book a Cardiff Airport hotel. Our database is filled to the brim with great options. 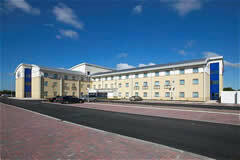 All you need to do is enter your search requirements and we will show you all of the suitable Cardiff Airport hotels. It really is as simple as that! Do you want a Cardiff Airport hotel with parking? Perhaps convenience is the most pivotal factor to you and thus you want a hotel that is located close to the airport? Whatever your requirements may be UKACP can assist. Your search can easily be narrowed down based on the facilities you require the most. It has never been easier and cheaper to arrange your stay at an airport hotel. With so many options to choose from and the most convenient booking method, you won’t be disappointed when using UKACP. Once you find a hotel you are happy with you can book via our site and it will only take a matter of minutes. Look out for the email confirmation, which you will need to print off and bring with you. The Holiday Inn Express offers something a lot of other hotels cannot and this is a view of the runway, however, don't worry the hotel has quadruple glazing! It ticks all of the boxes. It is clean and comfortable, whilst the staff are friendly and go out of their way to help you in any way they can. This hotel also offers secured car parking as well as free transfers to the airport which run 24 hours a day. The Holiday Inn Express is also popular amongst families, as it has everything from air hockey to pool tables. There is also wifi throughout the hotel so everybody will be happy! Nonetheless, there are some other great hotel options as well. This includes the likes of The Sky Plaza, which is excellent value for money and also has free wifi. Although the Sky Plaza cannot compete with the Holiday Inn Express whe it comes to entertainment, it does however help to keep the costs down, always important for travelling families! Both of the hotels mentioned have transfer services available. The Sky Plaza offers transfers by taxi, which will cost approximately £6 return for up to four people and they have wide doors to accommodate wheelchairs. The Holiday Inn Express offers a free transfer service. This is the hotel’s bus, which will take you to the airport when needed and is available 24 hours a day. Make sure you arrange this with the reception beforehand. Don't forget that if you decide not to stay in a hotel the night before you fly you can still save money on our Cardiff airport parking packages. We will always save you anything from 15 to 60% compared to the car park gate price.